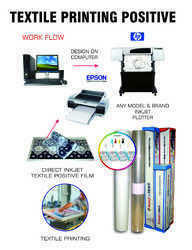 Our range of products include inkjet printable positive films. We are offering a premium collection of Inkjet Printable Positive Films, which is manufactured from premium quality materials. These are fully transparent clear film for computer-to-film digital imaging using recommended inkjet printers. These are ideal for half tone, full-color screen positives, in any size, with unbeatable value-for money. These are perfect for producing high resolution. Looking for Positive Films ?